Broadway Discounts Are a Millennial Student’s Best Friend Series Part 3: Rushes, Deals and Lotteries, oh my! It’s not just about having sharp eyes for deals. It’s all about luck and timing to increase the odds. Sometimes TDF or TKTS doesn’t do for you. Luck be a lady tonight, let us talk about other deals, rushes, and lotteries. 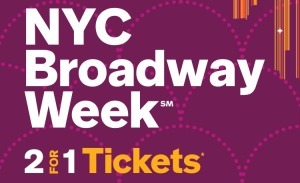 Around early September and February, it’s the semi-annual Broadway Week! This means theatre producers are releasing two-for-one ticket deals for a time frame. Snagging an extra ticket is a magnificent bargain gift for your Broadway buddy–or relatives to introduce theatre too. Broadway Week happens twice a year, so exploit it when it comes around. Tickets sell out fast. Profit is a full house. When there are empty seats, theaters scramble to get them sold and filled. The TKTS booth is a popular place to hunt for rush tickets, but some theaters sell rush directly from their own box office. Go to a production’s personalized websites and see when $30 rush tickets are available. Rush tickets often are available 2 hours before showing, but some buyers are lucky to just walk up to a window 10 minutes before curtain and obtain a rush. Sometimes rush is offered at the crack of dawn right when box office opens. I made the mistake of chancing that A Band’s Visit might offer rush only two hours before a showing. But once I reached the booth, I was told there was none and rush were actually sold in the morning. The free TodayTix app can inform you of available rush tickets through notifications. Rush for Hello Dolly can amount to $39 seats. Bonus Hack: You’ll get a referral code when you sign up on Today Tix. Post your referral code on your Twitter and Facebook. Find a Broadway buddy who is also on TodayTix and use their referral code to get $10 credit when purchasing, and tell them to use your referral code for credit. Many years ago, I lingered in a crowd of fans at the Eugene O’Neill Theatre to enter my name into the then hottest-Broadway Best Musical Tony Award-winning Book of Mormon lottery for discounted seats, with up to two tickets for each entry. Alas, Heaven did not smile upon me and my name wasn’t drawn. Some high-demand productions conduct an in-person raffle at their theatre doors, usually in the range of $30-40. While this is becoming a thing of the past (thanks, digital age), some theaters still operate in-person lotteries. 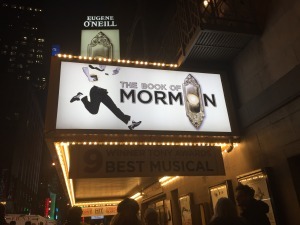 As of 2018, Book of Mormon still conducts in-person lotteries (now $37 tickets) while also supplementing it with digital. Digital may save us the inconvenience of going outside. But the wonderful thing about in-person lotteries is the atmosphere of community and the suspense of hearing your name called out. You can insert one entry for up to two tickets. To increase the odds, bring your Broadway buddy so they can slip in a 2-ticket entry. Warning: DO NOT enter your name twice in the raffle. Not just because you will get caught because they do double-check for double-entry. That’s cheating and not fair to the other participants. The theatre will ensure that you slipped in only one entry form. Sometimes a well-intended friend or family member might throw in another entry card for you, but make sure they don’t. There is a horror story of a disappointed girl when her friend threw her name twice into the raffle without her consent, disqualifying her from claiming tickets. Ah, technology, enabling us to do tasks from the sinking comfort of the sofa or bed. If you’re not a fan of snow slipping into your boots or the sun beating down on you, digital is your thing. The miracle with a production like Book of Mormon is that it holds its own digital lottery and in-person raffles, and you can enter both to bolster your odds. Each production can hold their own digital lotteries, including Phantom of the Opera, School of Rock, Anastasia. Broadway Direct Lotteries online hold lotteries for $30-$40 seatings. A friend testified that he won a total of six times: from Willy Wonka (which is closed), to Wicked, to Lion King. 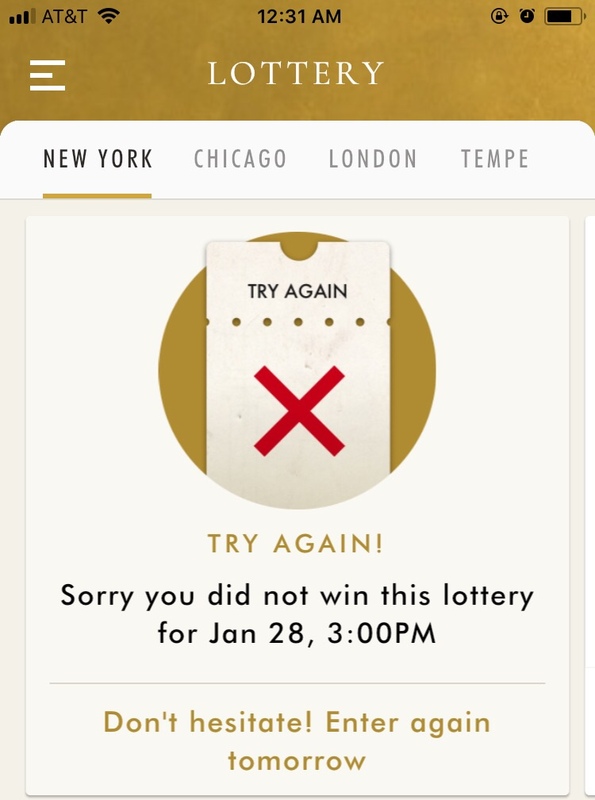 Ham4Ham Lottery: The Hamilton app has a lottery for the coveted $10 tickets, ironically the cheapest lottery tickets around for a notoriously high-demand production. Also, it has a notification system. 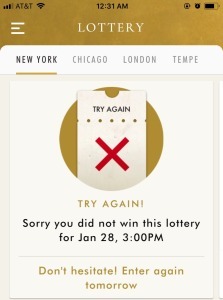 Not all lotteries can offer smartphone notifications like the Hamilton app. It’s up to you to check each production for the lottery opening times. Set alerts on your smartphone to remind you to submit your entries. So when you lug yourself out of bed, you’re getting your shot and you ain’t throwing it away. A win can just be a few finger taps away. Someday, I’ll be in the room where it happens. Playbill has more info on where to find rushes and lotteries for each currently-running production. So despite the fact that a textbook I read for a history class compared the “nationalism” of California to that of a community with nation status, no one I know from home stayed in California for college. I come from Oakland CA, the Bay Area, a fifteen-minute BART (Bay Area Rapid Transit) ride from downtown San Francisco. Everyone I know who lives in that area, including my mother, who is from New York, and my friend, who is from China, loves the Bay Area with their whole soul, which makes it confusing why we would choose to leave. My personal theory is that all of us know we’re coming back. When people go to college, they might want to see how they like it and then decide where to live, but everyone I know is going to live in the Bay Area. They might visit other places or work in other places, but they will live in the Bay. Because the Bay is home. So we all left. In preparation for this, my school librarian hosted a “how to dress for the winter” informational session during lunchtime after college acceptances had come out. It was widely attended. Said librarian, who is from Boulder, Colorado, instructed us in the use of hats, scarves, and gloves, items that I basically knew existed, but had never voluntarily owned. 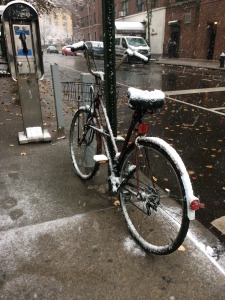 I’m still adjusting to the city, asking my roommate from Connecticut whether this is scarf weather. And today, fed up with the idea of “socks,” I elected to walk to the dining hall in flip flops. My feet got wet and cold and I slipped a few times, but I made it. The Californian has survived. Besides the weather, there are other adjustments to make when coming from the West Coast to the East Coast. The East Coast is old blood, colonial revolutionary blood. That means the East has traditions. Standards. The West has none of that. I have friends whose family came over in the gold rush. They were opportunists looking for a “get rich quick” scheme. If there’s one way I can sum up the Bay Area’s culture it’s this: the Bay hates formality. Anything you can do to take it away is good. Calling your teachers by surnames seems a little much, let’s go with first names, or even nicknames. Not being able to swear in class? Let’s get rid of that one too. We didn’t graduate in a cap and gown. We could wear whatever we want and some of the kids wore caps, some wore gowns, some wore both and some wore neither. We looked about as coordinated as a jamboree class. As a high school student, I spend some time on the Berkeley campus. Everyone on the Berkeley campus is wearing sweatpants, sweatshirts and flip flops. And because the temperature never gets below 50 or above 80, they look like this year round. This all conspired to mean that when I walked into my 8 am first year math lecture to see people in heels and makeup, I was confused. I looked down at my own legging-clad legs, shrugged, and went to sit down. My personal overture towards both coasts is the “leggings and heels” look, which gets across comfort without sacrificing too much dignity, though it’s very uncomfortable if you’re late to class. My first impression of New York was that it’s a city of people going places on their way to other places. People in California are busy too, but they stand still for a second, sit down for a meal. New Yorkers are going to meetings on the way to their other meetings. Abigail McManus, a first year linguistics major, is interested in all things words and stories. In her abundant free time, she writes and thinks about language, as well as practicing Jiu Jistu and Karate. She is from the San Francisco Bay Area and she’ll tell you about it if you let her.